This production workshop will evaluate both green manures and animal manures, in all their various forms and applications and their value in Organic production systems. The program will feature presentations by researchers and a producer panel of folks with experience in green manures & incorporating livestock manure into their operation. 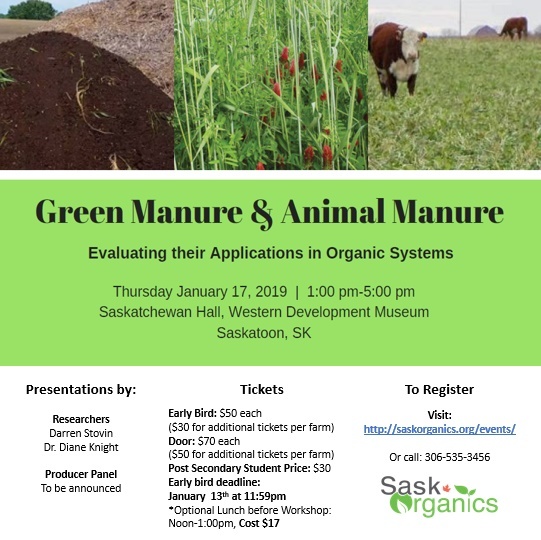 Whether you just want to learn more about green manures, or you are thinking of adding livestock (or just livestock manure) into your operation, this workshop will be a good opportunity to examine these two important forms of fertility for Organic farms.